We’re calling the first day on the bike “Day 0” because we spent more time dealing with logistics than actually riding. We arrived to Seattle on a red-eye from Kona, HI around 6:45a. Ted got about 2 hours of sleep and Dani estimates that she got between 3 and 4. Needless to say, we got off to a bit of a groggy, grumpy start. We navigated a confusing modified public transportation schedule (due to a marathon) and arrived around 9a to a colleague of Dani’s dad’s house to assemble our bikes, which the colleague graciously received and stored for us. Our bikes were relatively unscathed after the cross-country FedEx trip, and Ted expertly threw them back together using fancy bike-throwing-together techniques Dani doesn’t understand. We then got on our bikes. Dani had never ridden a touring bike with back and front panniers before and immediately regretted not acting on her notion to load up the bike back home to get a hang of things in Prospect Park. Instead, she sort of wobbled through busy Seattle streets silently cursing her decision to spend her summer riding a heavy bike across a giant country. After running (wobbling?) several errands around Seattle (shopping for food and cooking fuel, etc. ), we boarded the 3:45p Bainbridge Island ferry. The ferry ride was beautiful, complete with a lovely view of Mt. Ranier. 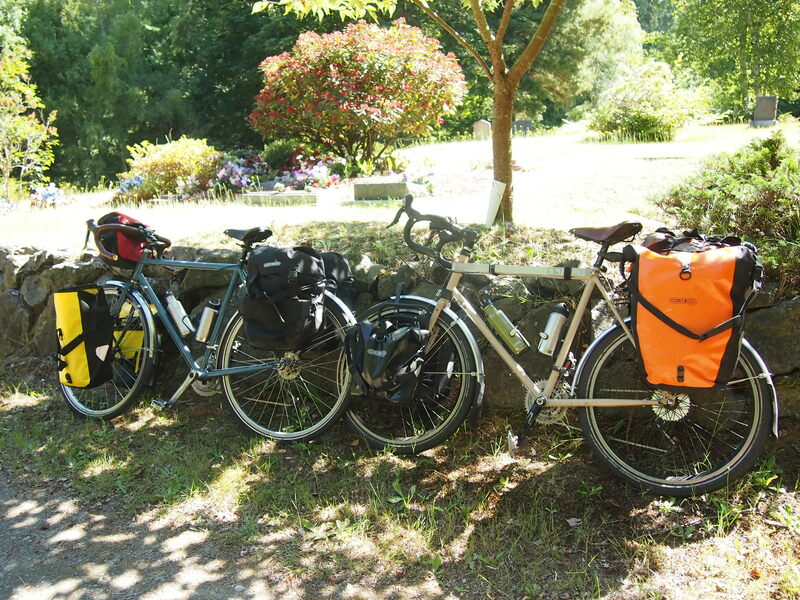 After getting off the ferry, we began our trip in earnest, intending to ride straight to the Fay Bainbridge Campground only 10 miles from the ferry dock. But Ted spotted a brewery not far off the path and we decided that our 10 total miles of riding so far today merited a visit to a microbrewery for some celebration. Turns out the brewery (Bainbridge Island Brewery) was having their own little celebration for their three year anniversary. We got delicious beers, of course, but they were also barbequing so we got delicious pulled pork sandwiches. 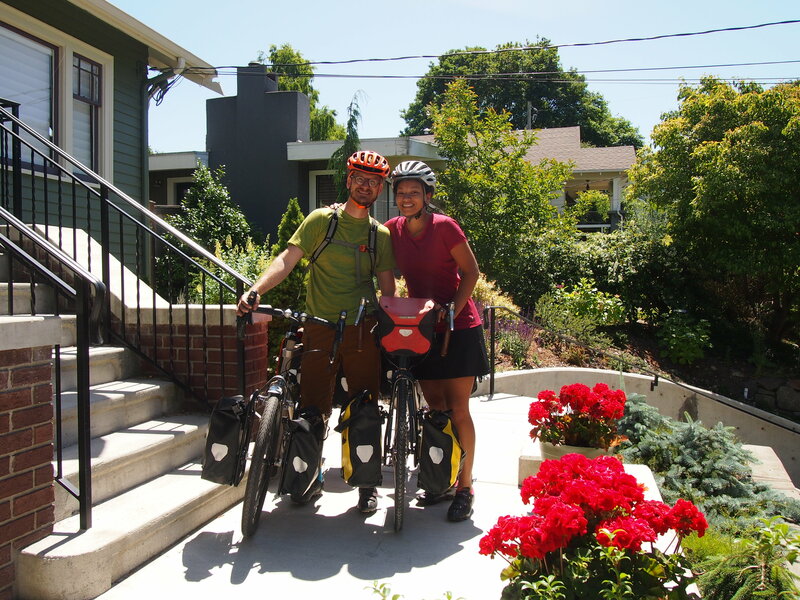 Every bike tour blog we’ve ever read and every bike tourist we’ve ever talked to has emphasized how meeting amazing people and receiving random acts of kindness is perhaps the best part of bike touring. And it is. And we were truly excited for that aspect of the trip. But we really didn’t expect it on the very first day, 10 miles into our 4,000+ mile ride. While we were sitting outside Bainbridge Island Brewery, enjoying our pulled pork and tasty beer, up walked Sue and Lloyd, who live nearby and invited us to camp in the yard behind their beautiful house, a few minutes away from the Puget Sound. (I think. It’s entirely possible it was a different body of water.) We rode back to their house; walked down to the beach; and chatted about bike touring, the beer scenes on the east and west coast, Peace Corps, and more. We were able to shower (yay! ), make adjustments to our hastily assembled bikes, and reorganize all of our panniers (for what is certainly not the last time) before we called it a night, telling Sue and Lloyd that we were planning to hit the road between 7a and 8a the next morning. We woke up at 7:35. Oops. We packed up all of our gear while sipping on the delicious coffee Sue made for us. Then we chatted for a while more before we actually got started. I think we were subconsciously delaying starting out. Getting started is always so hard! Sue and Lloyd gave us some tips on the best route to take and we started the day riding through winding side roads with rolling hills before reaching a busier highway. It seems like people name their driveways when they buy a plot of land up here, which is common in vacationy places, I suppose, but here they get official road signs made. We saw some fun names like See Forever Lane (Ted’s favorite, but Dani thinks “Sea Forever” would be a punnier name) and uncreative, descriptive names like Water View Road, Mainland View Road, and Harbor View Road. We ate breakfast at a lovely cemetery, then continued on to Port Gamble and were lured into a delicious barbeque lunch (with mind-blowing garlicy cheese fries). We then traversed a cool floating bridge with an incredible view of the water with the Olympic Mountains as a backdrop. The app we used to plot out this ride (Ride with GPS; highly recommended) took us on a beautiful side road through Shine, WA where we rode on the water with those same gorgeous water/mountain views and no traffic whatsoever. We jumped back on the highway, then rode through a rock quarry to avoid more traffic. We stopped (again – lots of stops!) at Chimacum Corner Farm Stand because they had a sign for ice cream and fresh fruit. Dani tricked Ted into thinking she was mainly interested in the fruit, but ran straight to the ice cream stand, of course. This shop was capital A adorable and we would have spent all of our money here if we didn’t have limited pannier capacity. We bought some snacks and some veggies for dinner, then headed out for the last leg of our first day. 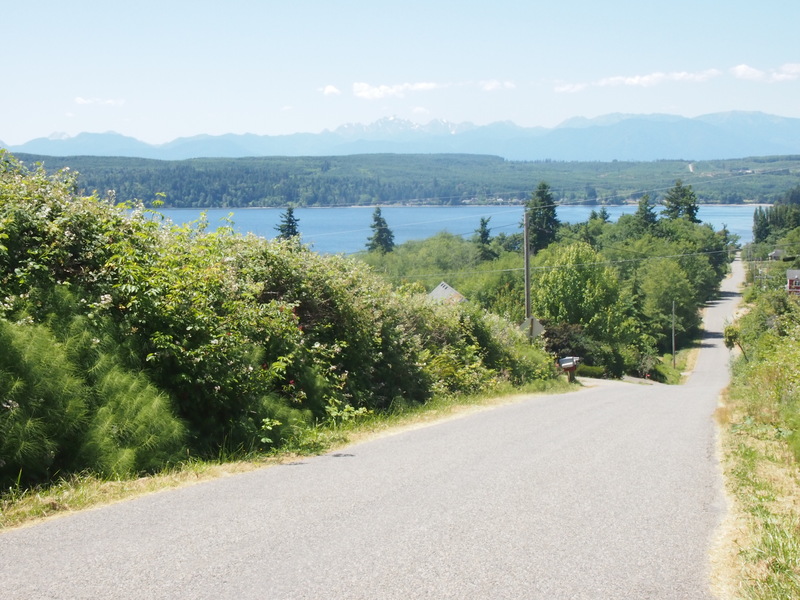 A few miles from Port Townsend, our final destination and the location from which we’re writing this post, we entered the Discovery Trail, a lovely bike trail that went along whatever body of water we’re close to. It’s hard to keep track of all of the names of water bodies up here! Biking down the Olympic Discovery Trail. Overall, it was a hilly, challenging day that made me (Dani) a little nervous about my lack of training for this trip (turns out inconsistently bike commuting through flat-as-a-pancake NYC is NOT sufficient preparation for riding 50+ hilly miles with a loaded bike), but we’re hoping that we sort of train as we go and things will be easier in a week or two. Wishful thinking? Perhaps. But our friends on Bainbridge Island taught us the mantra they learned on their bike tour through Portugal that applies here: sempre frente. When they asked for directions, this was a common response and it means “always forward.” That’s how it felt today and I’m sure that’s how it will continue to feel, but we’ll just keep pedaling until we hit the Atlantic Ocean! We read several blogs to prepare for our trip and most said little about the food they ate. We think the most important part of traveling is food, so we’re planning to try our best to document our meals, whether eaten out or cooked at camp! Day 0 Dinner: Pulled pork sandwiches with baked beans (with cilantro!) and mac and cheese (with Goldfish Crackers?!) at Bainbridge Island Brewery. Day 1 Breakfast: Granola bar, peanut butter and jelly sandwiches, coffee. 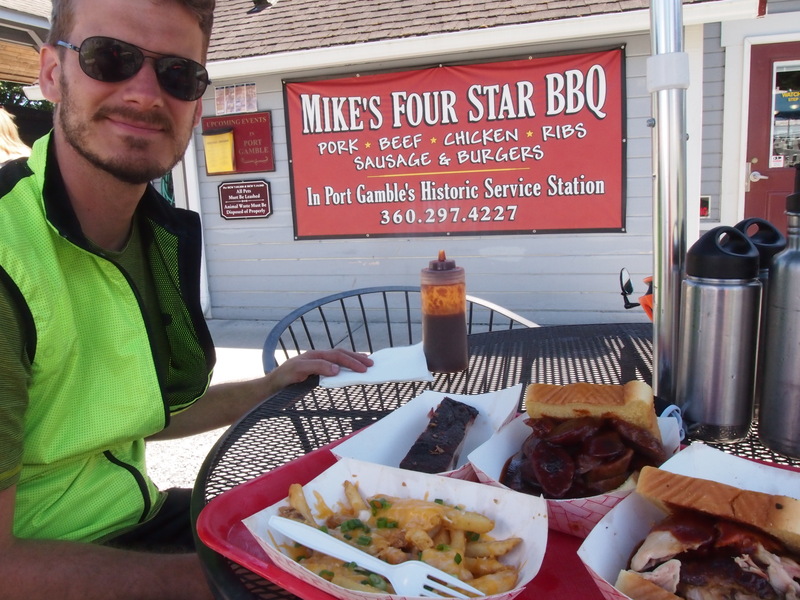 Day 1 Lunch: Pulled chicken sandwich (Dani), smoked sausage sandwich and a single BBQ rib (Ted), garlicky cheese fries at Mike’s Four Star BBQ in Port Gamble. Day 1 Snack: Cardamom / bittersweet chocolate ice cream cone (Dani), fancy chocolate milk (Ted) at Chimacum Corner Farm Stand. Day 1 Dinner: Spaghetti with a spicy broccoli, mushroom, and tuna marinara (to be cooked once we reach our campsite). 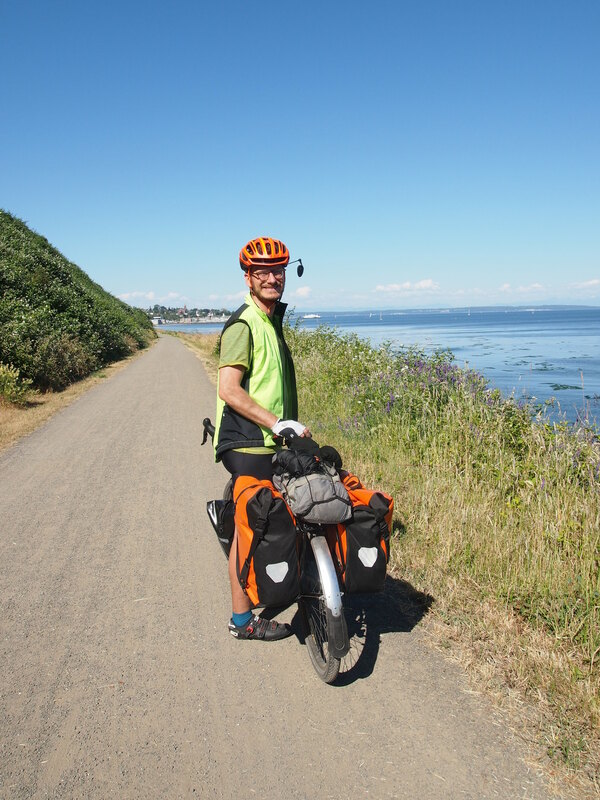 ← What are panniers? What are granny gears? Thanks Casey! I hope you enjoy following along with us as we go! Tommorow you will see Deception Pass. I think you are in for challenging couple of days as you cross the Casacade Mountians. Central Washington is much flatter. You sure were spot on. Rainy and Washington passes kicked our butts today, and we’re taking a easy day tomorrow to avoid going over Loop Loop. I look forward to the flat rides, but the riding in Western Washington has been gorgeous!! First, the name of your blog is just great — Second, I SO envy the way you’re making your way across the country one beer/BBQ joint at a time; just how I’d do it! Keep pedaling and stay safe! We figure there will be plenty of days on this trip when we won’t have the opportunity to say no to delicious food, so why say no when it’s available? I had a lovely Deschutes Fresh Squeezed IPA today that I think you might enjoy if you ever see it around. Thanks for following along!